Meet the Inhabitants of The Quiet Pond! “What do you mean, old friend?” you ask the axolotl. You have many questions after what you’ve just seen – a gardening tortoise? a frog sewing? 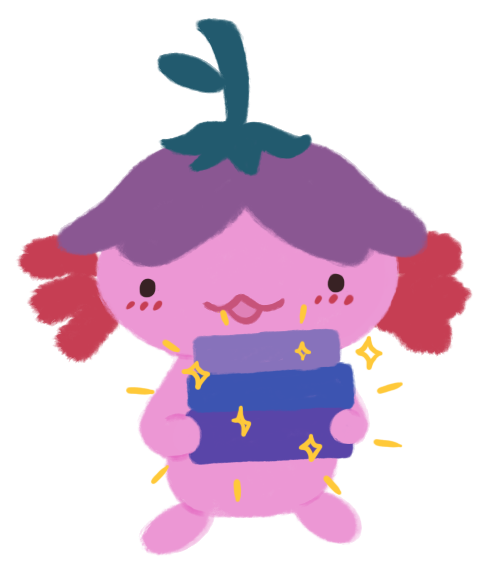 a talking axolotl? – but you feel a familiarity here, and hearing ‘old friend’ tugs at your heart. Who are the inhabitants at The Quiet Pond, and what kind of magic do they do here at The Pond? Thankfully Xiaolong loves making introductions! Don’t be shy and say hello. Xiaolong (小龙) is the Keeper of Magic in the Pond and is, indeed, a very pink axolotl. Nowadays, things are quite quiet here so Xiaolong mostly ensures that Gen’s plants are growing well (sometimes giving the plants the boop that they need) and Varian has enough materials to make their costumes. However, Xiaolong’s biggest job in the Pond is to share with you the latest books she’s read. In other words, you’ll see her whenever there’s a book review! 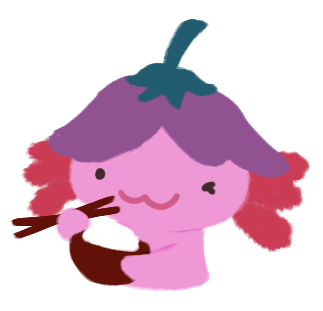 Xiaolong’s favourite food is xiao long bao (share with her some of your xiao long bao and she’ll welcome you to the Pond forever), she loves seedlings growing by the pond (she thinks they are very cute), and performing magic that makes people happy. In general, Xiaolong loves a lot of things, but don’t ask her if she has a nickname that’s easier to pronounce – she likes Xiaolong, thank you very much. Meet Gen! Gen is the Tortoise Apothecarist at the Pond, and is in charge of the herb garden here. If there’s one thing that gets Gen excited and happy, it is growing new plants and sharing the produce and flowers with The Pond’s visitors. That’s why when you see Gen, he will be sharing with you some of the art or graphics from his garden – just for you! Obviously, Gen likes tending the pond and his herb garden. Gen used to grow herbs for magic craft, but now he mostly grows spring onions and ginger for Xiaolong’s dumplings as well as watercress – his favourite snack! Gen also likes a nice sunny rock, clear water, and when people ask before they can touch his shell. This is Varian and they’re a Toadshifter! When Varian was just a tadpole, they were in a muddy puddle: they didn’t know what they wanted to be when they grew up. So they decided that they’d be everything – a mage, a warrior, a necromancer, a hunter – and decided they’d learn all kinds of magic. (Xiaolong nudges you and says, “Varian is a very powerful Toadshifter!”) That’s why whenever you see Varian, they will have a lot of books to recommend. After all, Varian has to be very knowledgable to be a Toadshifter! Varian loves cosplay and creating their own costumes – magic and sword craft isn’t the only craft they know! In saying that though, Varian doesn’t think you have to be the best costume to be the best – they believe that having fun and loving what you do is the most powerful kind of magic. “Is Amina magical too?” you ask. This is Amina, the Hedgehog Bard! She isn’t a resident at The Pond, but she does visit to say hi to her friends, share a few stories from her travels, and replenish her magic as a magic bard. When Amina isn’t here in The Pond, she is visiting other magical lands, making new friends, and learning different types of music-magic. So if you catch Amina in The Pond, Amina will be sharing some of her wisdom through bookish or psychology-related discussions. I hope you all enjoyed meeting the inhabitants of The Quiet Pond. Hopefully you will get to see them often, and if not, you can always revisit this memory and see them all over again. But wait – your heart starts to tingle, and suddenly a small and magical sprout appears before your feet! It seems that a new section of The Quiet Pond is now open to you: Features! You haven’t made any new memories with the Pond yet though, so come back once the inhabitants have shared some of their magic with you. Over your next few visits to the Pond, Xiaolong will be sharing with you some of her favourite books of all time. (She thinks the best way to get to know someone is to share your favourite things, after all!) So we hope you will visit again soon. Until your next visit, take care and happy reading! They’re so cute 🤩 can’t wait to hear more about them. Would love to get to know their personalities more. Aw, thank you! 💛 Haha yes! You’ll get to know them over time. Thanks so much for visiting! Ahhh I absolutely adore this post, cw!! I already love all the Inhabitants, especially Xiaolong (even more so because we share a love for xiao long baos), and Anima’s absolutely adorable. I’m so in awe of your blog & I can’t wait for your future posts (and I lowkey wish I had enough time to apply for a co-blogger position 🙈). And thank you so much. :’) I’m so honoured that you like it, and I hope you’ll like what I have planned for the future! I absolutely ADORE all your characters so much, CW! Your blog taps into my love of games as well as books, and I am so excited that you have created it. Lovely job! OMG THESE ARE GORGEOUS and i love meeting all of them! these are adorable, CW and i can’t wait to see the awesome content they bring us! THERE ARE THREE IF YOU (or Xiaolong) ARE EVER IN NYC/New Jersey!!! Aw Kat, that’s so sweet! 💛 Thank you for the kind words and I’m super happy that you love them. I love this, CW, and what you are creating here, because it’s so unique and fun! Also, here I was thinking Xiaolong was the cutest animal at The Quiet Pond, and then bam you introduce us to all these charming babies – I especially adore Amina, and I’m intrigued to see her posts. Aw, thank you so much! I’m so glad you think so that you like this so far. I am super happy that you love Amina. She won’t visit much but who knows – with free time over the summer, she might pop in to say hello more often. 💛 Thank you for the lovely comment! Psst…CW: you’ve done a fantastic job with the new blog! 😍 It’s so lovely. Oh my gossshhhhhhh CW, this is the cutest and most pure thing I’ve seen 😍😭 I love them all so much. this is ADORABLE! what a excellent way to structure your blog! and the illustrations are amazing, and I like that they have all the origin stories. I’m so eccited to get to know the inhabitants of the Quiet Pond better! Aw, thank you so much! 💛 I’m so glad that you like it and are excited. I’m excited too, and hope you’ll enjoy what I have planned so far! I love everyone already, omg 😭 I can’t wait to see what’s next!! Thank you! They adore you too. 💛 Thank you for stopping by and I hope you’ll like my next post!! I can’t believe how in love I am with your blog CW! 💖💖 I can’t wait to see your next posts and see more resident of the pond! AW, thank you so much!! I am happy that you like it and I’m excited for you to get to know them better too. Thank you Dezzy!! Who doesn’t love xiaolongbao?! hehhehe. 💛 I already have some book recommendations and discussions planned, so I hope that you will enjoy them when the time comes! I would die for them. Especially Gen, I WOULD GROW A GARDEN JUST FOR YOU BB. Esp when you promise to bring us good art and graphics ❤ ❤ This is seriously too adorable and I am in love. 💛💛💛 And I love you, Aentee! And GEN LOVES YOU TOO, SUPER DUPER MUCH. Thank you so much Inge! 💛 That makes me super happy to hear. I love RPG so defs wanted to do a little homage to it. OMG, these are so cute, CW 🙂 I loved them all. These characters make it so much fun to read your blog.